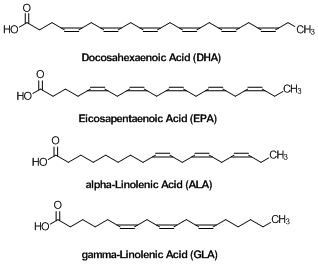 Poly unsaturated fatty acid structures are deceptively similar. Small molecular changes made in every cell of the body translate into large shifts in physiology. Omega 3 fatty acids DHA and EPA are found in fish oil and provide most of the benefits ascribed to it. Alpha-linolenic acid (ALA) is found in numerous places, but primarily in flaxseed oil supplements. A small percentage of this omega-3 fatty acid is partially converted to EPA and then DHA in the body. Gamma-linolenic acid (GLA) is found in borage oil and evening primrose oil. This omega 6 fatty acid has natural anti-inflammatory properties. How to tell is a fatty acid is omega 3 or omega 6? Look at the structures and count lines backwards from the methyl ("CH3") group. If you count to three and get to a double line, it's an omega-3. If you get to 6, it's an omega-6. The double line represents a double bond, or point of unsaturation. In the diagram here, DHA, EPA, and ALA are all omega 3s. GLA has an omega 6 structure.